I was skeptical when I returned to Dartmouth having had only three actual days away from campus. During the conventional school year, everyone seems to stretch themselves thinner than Domino’s thin crust at 2am (RIP EBAs). But summer? Summer is the term where we supposedly free ourselves from our usual commitments, and make way for river floats, ice cream and farmer’s markets, with a splash of school work. While I no longer have sports or a capella commitments to worry about, my schedule looks oddly ... full? I’m taking three classes this term for my intended major and distributive requirements. I have a leadership position in my sorority, two jobs and a research position in the history department. I’m not quite sure how it all piled it up like it did. Perhaps it’s my aversion to boredom, or my habit of being a serial “yes” woman. Whatever the reason, this term is really no different than any other term. It’s just warm outside. I have never quite understood people who take a laissez-faire attitude toward their college experience. Even with its shortcomings, Dartmouth is one of the most amazing colleges in the country. No doubt, whatever your background, you were overjoyed when you first opened your acceptance letter. But here we are, halfway through our tenure, and we have already taken it for granted. Skipping classes and finding “layups” takes precedent over squeezing every possible opportunity out of our collegiate career. We will never be as emotionally, socially, or intellectually challenged as we are here. We get to see and learn from world renowned poets, musicians and lecturers. We have professors who pour their hearts and souls into making known the experiences of the marginalized, overlooked and forgotten. We have deans and support systems for the people of the many communities that make our class so much more than a set of statistics. My goal in writing this piece, if anything, is to pave a way toward considering a middle ground. I recognize people come into sophomore summer from different angles. I’m an advocate of the “you do you” philosophy. If what you’re doing makes you happy, keep on keeping on. I know that I will be challenging myself this term to get out of my comfort zone, leave behind my introvert ways and get to know our class. Yes, I’m busy, but I still go out at night. I hike my Sundays away in the surrounding mountains. I make sure my friends are just as important as my research hours or class work. With 17X looming before us, I know that buying into this wacky tradition is going to reward me (and all of us) with so much more than we could have expected. It’s true what they say – something in the air is different up here. No matter the demands on you this summer, it’s hard to deny the feeling of openness and opportunity on campus. It’s like we are all in mutual agreement that this will be our best term yet, and that attitude raises the bar. There’s something special about walking around campus and knowing that every face you see is at the exact same stage in life as you are. There’s something about lounging on the Green with friends that makes it feel like the sun is just hitting you for the first time. There’s something about Moosilauke and Cardigan hikes, cabin overnights and other crunchy must-haves that become as natural as our surroundings. There’s something about watching hundreds of students and community members join forces for cancer research that sends goose-bumps down my arms and makes me appreciate the kind of world we are working toward. 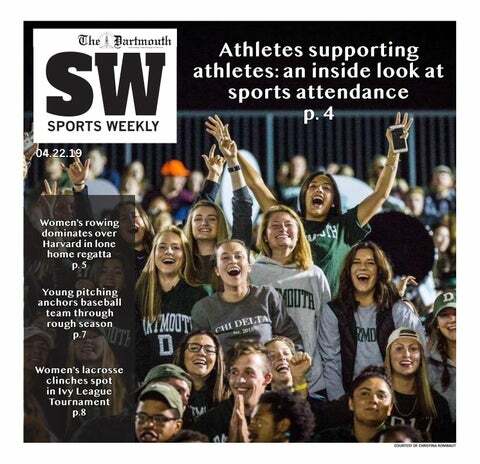 As we race into the heart of our sophomore summer, my hope is that we will continue on our journey to becoming Dartmouth’s best class ever (so corny, I know). I hope that we will acknowledge our strengths and confront our weaknesses. I hope we will smile as kindly to those stuck in the library as we do to those lying by the river. I hope we will recognize the hard work of our peers, lift each other up when we fall and join together at the end of the day for movies, s’mores and memories. Here’s to our best term yet!